Growing up with Spanish cultural, food and wine influences this month’s wine pairing takes a special meaning for us. Thanks to our friends in the Facebook Wine Pairing Weekend Group efforts, we received two wine bottle samples to share a taste of pintxos and Navarra Wines. Among the first thing that comes to mind when talking about Spain is their food. Widely known, tapas are a tradition that has transcendent Spanish borders. Though this time we’ll be taking on the art of pintxos, the Basque version of tapas usually served with a toothpick or stick to pinch them in place; hence “pintxos” or “pinchos” (from the Spanish verb “to pinch”). Just an internet search for pintxos and you will get limitless images of sumptuous foods. Though, not in Navarra, we have access to fabulous Spanish products that helps to replicate the experience. Wines as well are available to us; however, I have to admit finding wines from Navarra in the North Bay area has been a challenge. We grew up in Puerto Rico, where Spanish traditions and food are part of our culture. Just a visit to a Spanish bakery and you will find yourself with croquetas, mayorcas, flanes, natillas, chorizos, etc. We also have a version of “pinchos;” street food usually meat cooked at the BBQ, and yes on a stick. I would think our version is a descendant of the Spanish pintxos, coincidentally also served with a piece of bread. Traditionally, tortilla Española is one of the most recognized Spanish tapas, found in every Tasca. 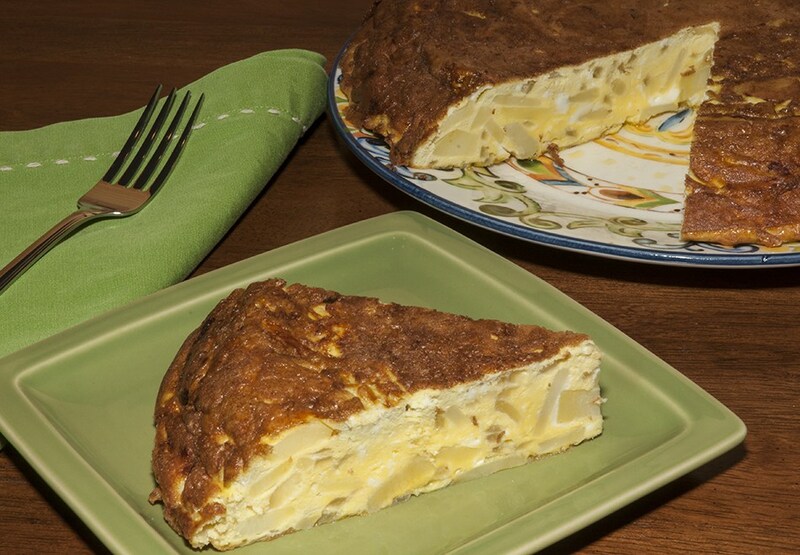 There are many variations of Tortilla Española; however, the authentic only has eggs, Spanish onions, and potatoes. Many times, I have prepared the tortilla adding Serrano ham or Spanish Chorizo. There are many ways of preparing an authentic Spanish Tortilla. You can easily find a video demonstrating how to cook the Spanish Tortilla. The tortilla pintxo I prepared to pair with the wines is served on bread and topped with Romesco sauce, a manzanilla olive, and garnished piquillo pepper. A staple in Spanish cousin. Croquetas can be made of almost everything you can imagine; however, Croquetas de Bacalao is one of my favorite tapas. I admit, making Croquettes is time-consuming, but they are worth it! If you may want to venture in preparing croquettes, my suggestion is to get a copy of the Cocina Criolla cookbook, by Carmen Aboy Valldejuli. This cookbook has the best croquette recipe I have ever found, and there is an English version. 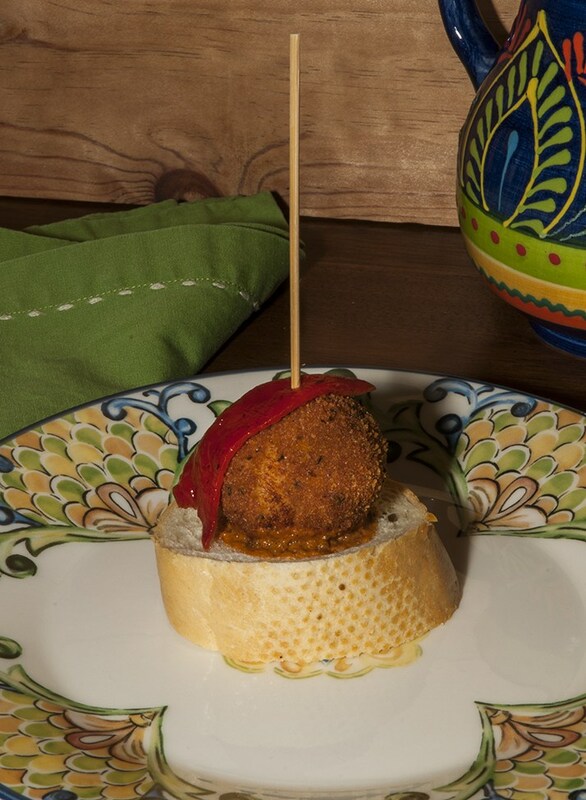 The Pintxo the croqueta is served on bread with Romesco sauce and garnished with piquillo pepper.